Happy Mother's Day Sis! 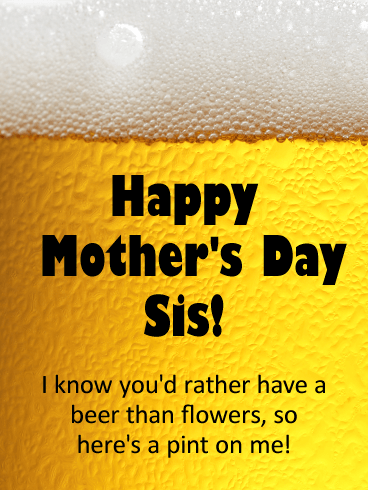 I know you'd rather have a beer than flowers, so here’s a pint on me! Even if she wasn't your daughter, you would choose her as your friend! When our daughters become mothers, there is a sweetness of life that is hard to express. 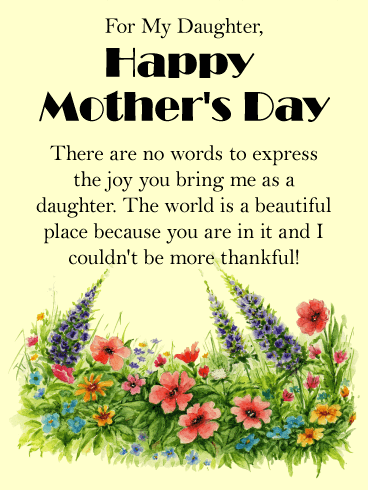 This beautiful mother's day card for a terrific daughter is a great way to celebrate the love you have for your daughter. 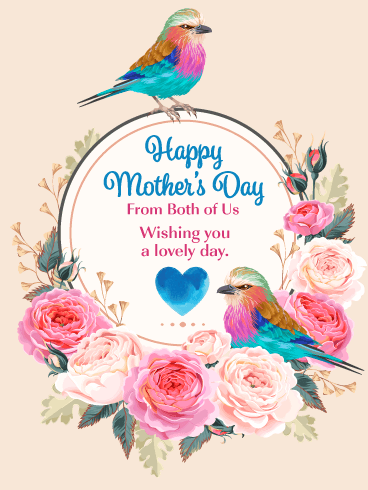 Let your daughter know how proud you are of the mother she is with this fresh and lovely mother's day card. Life is poetry in motion. Mother's day is a time to reflect on the beauty of life, and the necessity of love. Celebrate your daughter with beautiful blooms of flowers in this sweet and thoughtful mother's day greeting card. This is a day to delight in and a time to cherish. Let your daughter know her life is a fragrant offering of love to all around her; despite the storms and struggles, her life as a mother is worthwhile and valuable. Motherhood is meant to be celebrated. 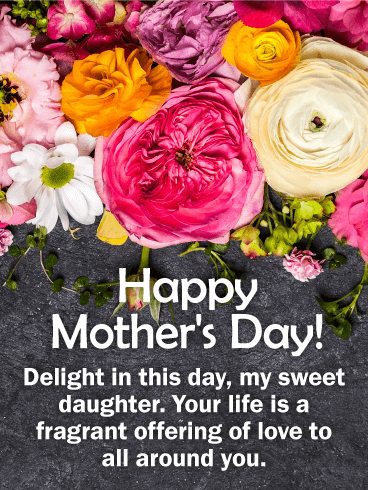 Send a beautiful mother's day greeting card to your daughter and encourage her in this meaningful path. Celebrate the tender beauty of being a mother with this gorgeous mother's day card. Patience, love, and wisdom nourishes family and inspires everyone around. Honor your dear daughter with this sweet mother's day card that is quick and easy to send. Motherhood is a treasure. Begin mother's day with a moment in remembrance. Send a sweet mother's day card to your grown daughter. You've watched her grow from a child to a woman, and love to see the mother she has become and her ability to remain such a free spirit! She'll always be your little girl! Send this beautiful mother's day card to your dear daughter today. It is a sublime moment when your daughter becomes a mother! Celebrate your daughter this mother's day with a beautiful card that honors her life. 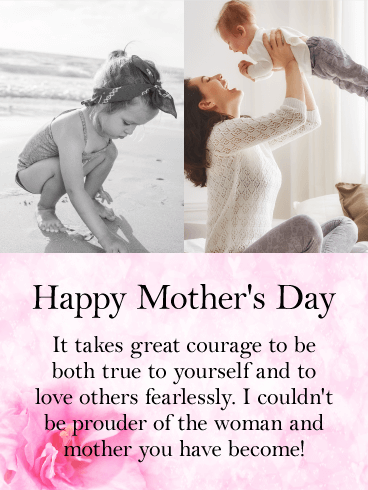 If you couldn't be more proud of the woman and mother your daughter has become, this mother's day card is just the one to send. Life and motherhood takes courage and great love. This mother's day greeting card for a dear daughter shares a powerful and sweet message. There are no words to express the joy a daughter brings. This gorgeous mother's day card for a wonderful daughter is the perfect way to wish her a happy day. Daughters make the world a more beautiful place. Let your daughter know how thankful you are when you celebrate her as a mother! Words will never do justice to your love, but a mother's day greeting card is a thoughtful way to try! Mother's day is a time to reflect and to rest, to indulge and to enjoy. 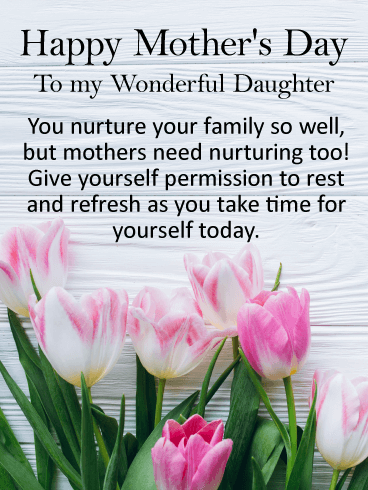 Send this charming mother's day greeting card to your daughter and remind her to pause and take some time for herself today. Mother's nurture their families, but also need to nurture themselves! Remind your daughter how wonderful she is with a beautiful mother's day greeting card. It isn't easy being a mom, but it is the most rewarding job you'll ever have! 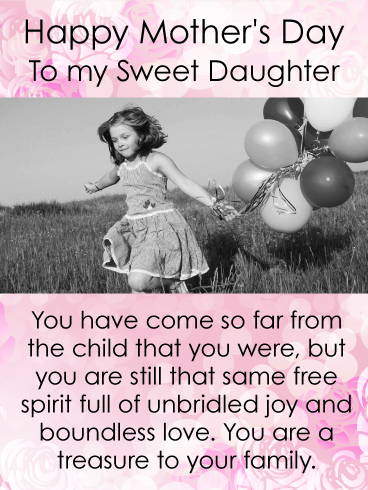 Honor your daughter's path through motherhood this mother's day with a heartfelt message. 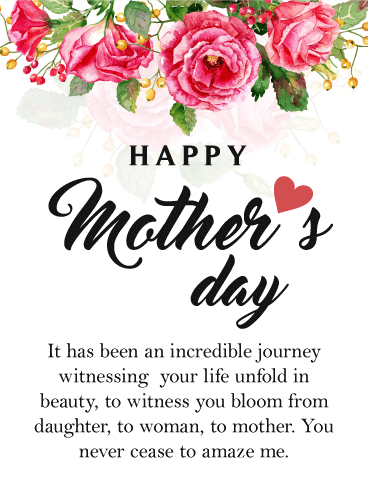 A gorgeous mother's day greeting card is a beautiful way to celebrate your daughter's life and let her know how proud you are of her. Motherhood is a journey and every path unique. 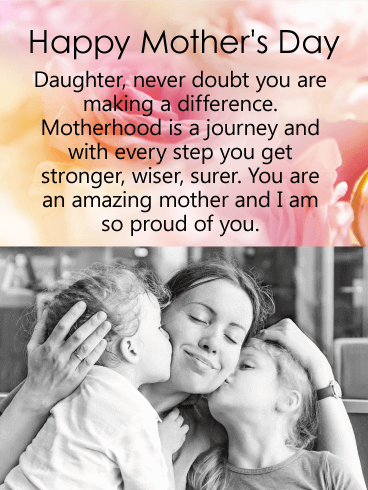 Share this encouraging message with your own sweet daughter this mother's day. Daughters are the joy of motherhood. 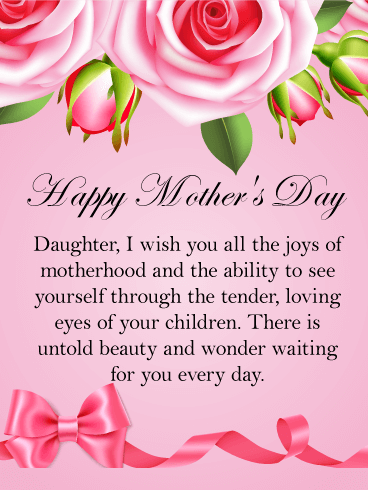 Share this beautiful mother's day card with your sweet daughter today. 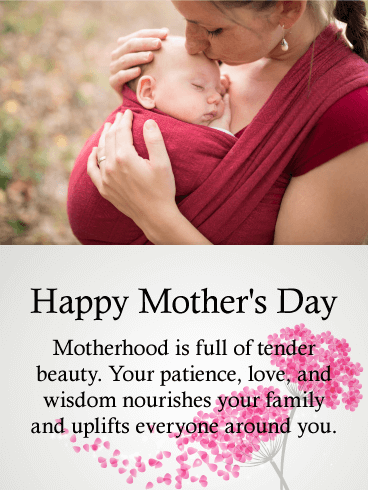 It is so important to take a moment to celebrate the hard work mother's do every single day. Wish your daughter the ability to see herself through the eyes of her children, so she would always know she is worthy and loved. 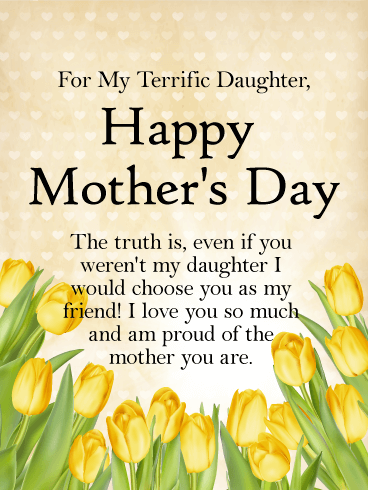 Send this lovely and sweet mother's day card with your daughter to wish her a wonderful day.